← How to convert emf to j2k? If your job duty is a secretary for the CEO,you need to spend a lot of time reading and checking many electronic books in your computer.And then you can collect all in formations that your boss need it.It is a hard time to finish this task .You often need to read the pdf file.So how to relieve your tired eye when you reading the pdf files.I think you not only want to the characters become big but also want to let the space the of the pdf file become large.Today my topic is how to hide the tool bar of pdf reader by using the Advanced PDF Tools.I hope it can provide you a good way to reduce your pressure and your tasks. First,double click the icon of the Advanced PDF Tools,let this software is working.Then drag your PDF file into this program.You will enter into the application interface.You can see the horizontal label pages like(Summary/Open actions/Optimize/Custom fields/About),please click the label page”Open action” ,there will appear a form ,in your left hand ,behind the “user interface option”,you can see the check boxes like (Not change/hide menu bar/hide tool bar/hide window control),you need to cancel the check box“Not change” and check the “hide tool bar”.Then save the change.Please look at the picture 1. 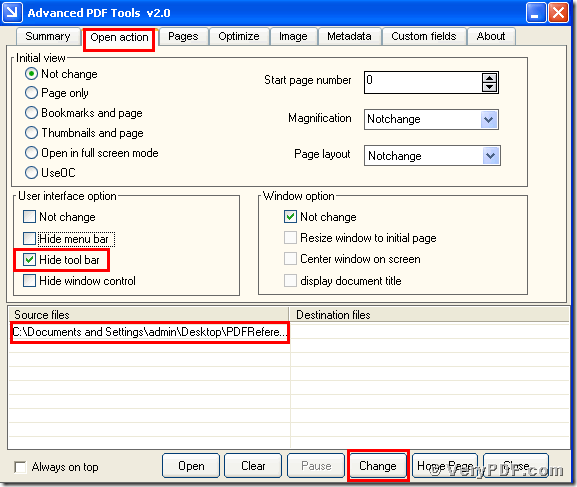 Second,open your changed pdf file, you will find the change,we had hidden your pdf reader tool bar.You see it’s very easy to make this setting,I believe that you are not afraid of the task ,if you are familiar with this software the Advanced PDF Tools,your boss will pay special regard to you.Please remember go to this website http://www.verypdf.com/order_pdftools_gui.html and purchase it,the price is not expensive as a office worker you can totally afford it.If you have any question ,you can contact the verypdf.com Inc. ,they will answer your questions in 24hours.